Make a wallet for your pocket and the planet. A free DIY template for a minimalist wallet designed to upcycle paper waste. This is how to make a minimalist wallet out of any materials like notepad covers, magazine covers, or cardboard. Although we make all of our products as eco-friendly as possible, we still believe the best way is to do it yourself and repurpose materials you already have handy. 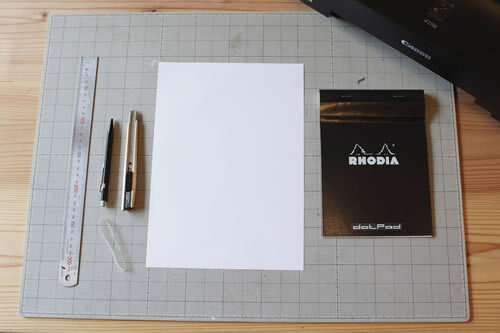 Our favorite material so far is the cover of Rhodia #16. It’s made of PEFC certified coated paper and water resistant which makes the wallet durable. Step2: Print out the template and cut the pattern. Download the free template here and print it out. Adjust the length of the pattern to fit the size of your bills, if needed. You could print the pattern directly on it if you choose a printable material. Step3: Cut out the material you choose using the pattern. Step4: Make V-folds along the dotted lines in the template. 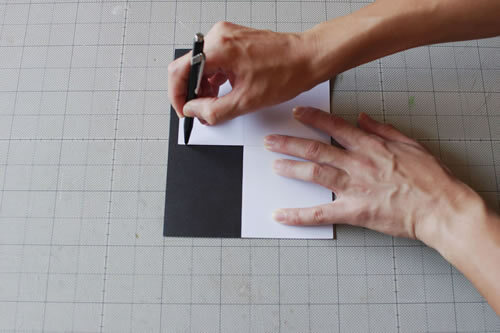 TIP: Drawing lines using the back side of the blade makes it easier to make V-folds. It just makes easier taking it in and out of your pocket. Step6: Put cash and cards in It and fasten them with an elastic band. Carrying cash and cards with ease is a wallet’s essential job, right? No need to fold bills in three, unlike other minimalist wallets. I prefer “Mobilon Band” which is thinner and more durable than common elastic bands, but use whatever you like as long as it does the job. Step7: Get ready to go light! That’s it. Yes, as simple as that. But it’s fully functional and durable enough for daily use. We hope it helps you simplify your life. Enjoy! Update: We’ve released a newer version of the DIY wallet that doesn’t require a rubber band. Enjoy this one too! Want a more durable wallet? Our products are incredibly tear resistant, water resistant, and machine washable. The more you use it, the more beautiful it gets. There is no substitute for a Kamino Wallet.